Often considered one of Brian DePalma's most accomplished films, the gangster music shoes of Nino Rota are here filled by Ennio Morricone. 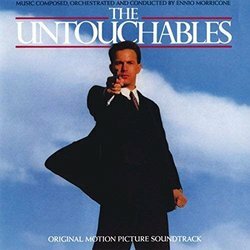 In truth, whereas Rota's Godfather scores were more about the people than the actions, Morricone's is perhaps more of a standard thriller/action score. While it isn't totally unheard of for a film music album to open with the End Title (often renamed as an Overture or similar), the decision here seems even more strange given the appearance of the Main Title halfway through. Whereas the End Title is something of a rousing fanfare, the Main Title is much more a suspenseful, thriller piece that functions much better at the opening. Similarly, the End Title really does work a lot better at the close, so for best listening, some re-ordering of the tracks is suggested. The End Title introduces what could be construed as the main theme, as such, an heraldic brass theme backed with swirling strings. Much of the rest of the score, is suspenseful and often low key, with tension building cues such as Waiting at the Border which use looped percussion and short melodic fragments that are built upon successfully maintaining the tension. Al Capone is given a larger than life and slightly comedic riff that comes close to spoofing the style of Rota's earlier scores. Otherwise, a more serious tone is adopted and the various themes and ideas are used well throughout the score. The opening title theme is given a reprise as an action motif in On the Rooftops and the end title theme appears during Victorious - which if placed in the correct track order is a much more satisfying first appearance for the melody. A final reason for doubting the album track order is the final Machine Gun Lullaby, which is the most protracted suspense cue on the album, but comes to a fairly sudden halt and as a way to end the album, is unsatisfying at best. Despite the dubious ordering of the tracks, this is another fine Morricone thriller score that uses the melodic material to best effect. It is also impressive for having suspense cues that do not become tiresome - Morricone invariably does well with suspense, avoiding merely cycling patterns, but actually developing some melodic interest along the way. If you sometimes find Morricone's style a little hard to take, this could be described as Morricone lite, not because it is in any way lacking quality, but simply because it is dramatic without being operatic and is inventive, without being overly quirky. A solid and sometimes inspired effort, well worth seeking out.